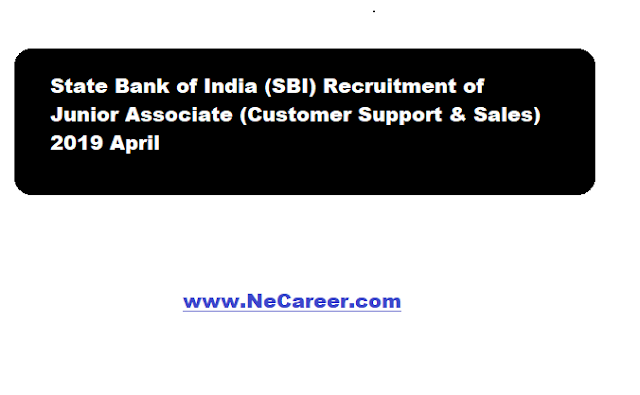 State Bank of India (SBI) Recruitment of Junior Associate (Customer Support & Sales) 2019 April :- Welcome to North East India's No. 1 Job Portal NeCareer.com .Finally SBI Recruitment 2019 for Junior Associate has been released.Applications are invited from eligible Indian Citizens for appointment as Junior Associate (Customer Support & Sales) in clerical cadre in State Bank of India. Essential Academic Qualification: Candidates must have done Graduation in any discipline from a recognized University or any equivalent qualification recognized as such by the Central Government. Those who are in the final year/semester of their graduation may also apply to SBI Recruitment of Junior Associate 2019 provisionally subject to the condition that, if provisionally selected, they will have to produce proof of having passed the graduation examination on or before 31.08.2019. Age Limit: Not below 20 years and not above 28 years as on 01.04.2019, i.e candidates must have been born not earlier than 02.04.1991 and not later than 01.04.1999 (both days inclusive). Age Relaxation is applicable as per rules. Pay: 11765-655/3-13730-815/3-16175-980/4-20095-1145/7-28110-2120/1- 30230-1310/1-31450. The starting Basic Pay is Rs 13075.00 (Rs 11765.00 plus two advance increments admissible to graduates. i) The candidates applying for vacancies of a particular State, should be proficient (reading, writing, speaking and understanding) in the specified opted local language of that State (mentioned in the vacancy table against each state/UT). iii) The test for knowledge of specified opted local language will be conducted as a part of selection process. iv) It will be conducted after qualifying the online main examination but before joining the Bank. Candidates who fail to qualify this test will not be offered appointment. v) Candidates who produce 10th or 12th standard mark sheet/ certificate evidencing having studied the specified opted local language will not be required to undergo the language test. vi) There is no provision for Inter Circle Transfer / Inter State Transfer for Junior Associates to be recruited. Interested and eligible candidates can apply online through SBI official website https://bank.sbi/careers or https://www.sbi.co.in/careers only from 12.04.2019 to 03.05.2019. No other mode of application will be accepted.